There are really a lot of good bows on the market these days, and its a matter of personal preference and what it works for each of us. I have been shooting since 2011 PSE bows. I found the PSE bows very reliable and the results they have give them in the field are outstanding. The performance they can get from a smooth drawing bow, on a solid shooting platform its what I look for on a hunting bow. Most of my hunting is spot and stalk, and the speeds they get really help absorbing those distance guessing errors. Once you get use to having the first pin at 30 meters its hard to get back to a slower bow. My set up is typically 70# @28.5”. I really like that most of the PSE bows have draw length adjustments. Its really important if you are starting, and makes it really easy to change in seconds the draw length. Every bow its a little different, and depending on the length and the release you are using you can move half inch your draw length to maintain a solid anchor point. I am typically between 28.5″ and 29”. I prefer to stick with a little longer axle to axle bow since I shoot better, I love them around 33”. I have shoot some shorter bows at almost 31” and its true that its nice to move around with them, and they can still shoot sweet. Brace Height I like to move around 6”, good compromise between speed and shoot ability. Not a big fan of big let offs, I prefer to get to 70% or 75% in order to have to maintain the bow behind pulling to brake the shot properly. Archery accuracy it is a combination of not only the bow, but also a good projectile. I really believe that good arrows worth it, they shoot better and last longer. Its probably one of the most important parts of the equipment, and its not often consider. I am shooting around 450 gr arrows, found it a good balance between speed, accuracy and penetration for spot and stalk. Lighter arrows are more critical and achieve less penetration. Moving to something heavier gains penetration but slows them too much and I have less confidence on putting them on the mark. I only move to weights above 550 for dangerous game and for tree stand hunting, were I know I will not be shooting over 30 meters. The arrow I am using its a Carbon Express Maxima RED 350. With weight built in forward and a dynamic spine they shoot better than any other arrow I have tried. The RED area is less stiff than the rest of the arrow and flexes more to absorb all the energy, but still the extreme parts of the arrows, which are stiffer, maintain their position to have an outstanding accuracy, specially with broadheads. I don’t know if all this works but the reality is that I love them, don’t know how many arrows I have already shoot, but I am sure there will be way more. I always equip them with short profile vanes 2” fletched with 3º helical. Good performance on cross winds, and with the stiffness they have they stabilize the arrows quickly with any broadhead. Bohning Blazer Vanes, short profile, low noise, durability and great and quick arrow stabilization. You can’t ask for anything else on a vane. In combination with their arrow wraps for good visibility on flight and easy removal without damaging the shaft is a killer setup. On the opposite side there is typically a mechanical broadhead. For long shots no matter how well you tune your bow there are always little differences, remarked in hunting situations by wind or poor shooting form. For accuracy, strength, penetration and performance I am using the Grim Reapers Razortip 1 3/8”. I try to avoid large cutting diameters than that, just in case it has to go trough some major bone. I have tried a lot of rests, and no doubt it has to be a fall away and I like those attached to the limb. The way the rest works when attached to the limb is that when you release, the limb pulls the cord and pulls the rest down, rather than the ones attached to the cable, where as you shoot, the tension on the cord is released and a spring is the one pushing down the rest. This makes them quicker and they do not interfiere with the cables. Full containment is the other aspect I look at on rest, it needs to hold, with some degree of freedom, the arrow at all situation. I like them quick and silent, both for loading and when drawing the bow. The Trophy Taker Smackdown is the rest I have been using lately, and I can not say anything bad about it, it is sweet and shoots awesome!. High speed videos proves that too. I like using five pins, from 30m out to 70m. A wheel that moves the whole housing works great for extending the distance longer than that for practice and fun. Pins must be micro adjustable for fine running. I like a larger first pin 0.19 and the rest 0.10. Green is the brightest color, I combine it with red too. The sight must have second and third axis adjustments. I like the issue of having a extended arm, both for extending it farmer for adjusting to the peep size, and also for quick disassembly. That quick disassembly makes me able to change one sight for spot and stalk, with one for tree stand hunting with just one pin and a heavier arrow. The auxiliary light must be focused on the fiber, and not to the whole housing. All this features are well covered by the Spot Hogg Father sight. The range of a 10” stabilizer seems like a good balance for hunting. Its hard to move with longer stabilizers, and its makes harder to perform a quick shot with a long stabilizers which is torquing the bow until you settle. I use also a side shorter stabilizer at the bottom to balance the complete bow sideways, and also it helps balancing the bow during the shot reducing last second errors. Doinker Stabilizer have worked great for me since the first bow I had. One thing overlooked on bow are the string and cables. Creep on string and cables produce shooting errors, peep rotation or even can ruin your complete bow tunning. Poor strings can also have problems with the serving on critical areas. These things can come out after time, but can be also produced by temperature changes. 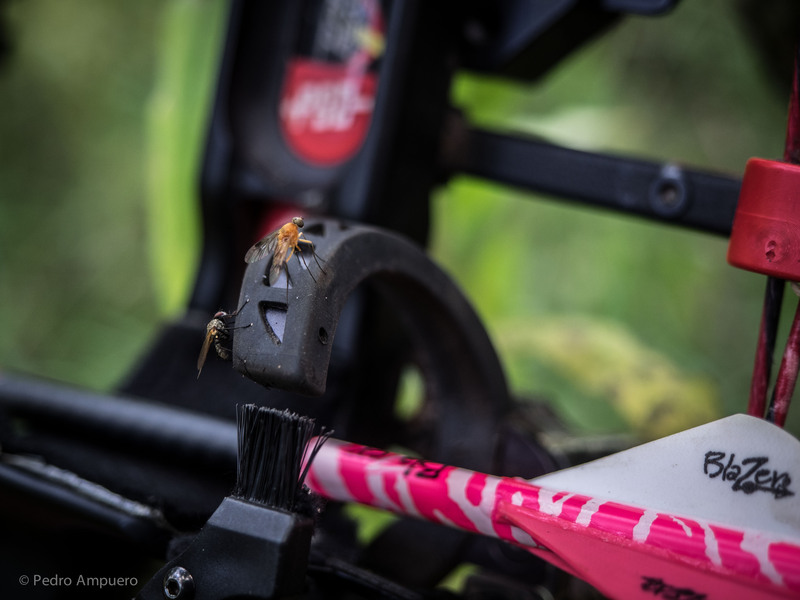 For this reason I always put in all my bows Winners Choice Custom BowStrings, the materials and fabrication process make them very reliable in all situations. I do also set my bows with a Total Peep. This peep is not affected by light changes or peep rotation so it is really convenient for hunting. Pedro, what kind of quiver do you use? I’ve been looking for one just like yours for a long time and haven’t been able to find one until I saw it in one of your videos. Check Total Peep adaptor and TightSpot quivers. Great option for hip and bow mount! !